Deeply invested in modern and contemporary art, the Widewalls magazine aims at providing a unique experience for its readers in the form of in-depth and quality journalism. 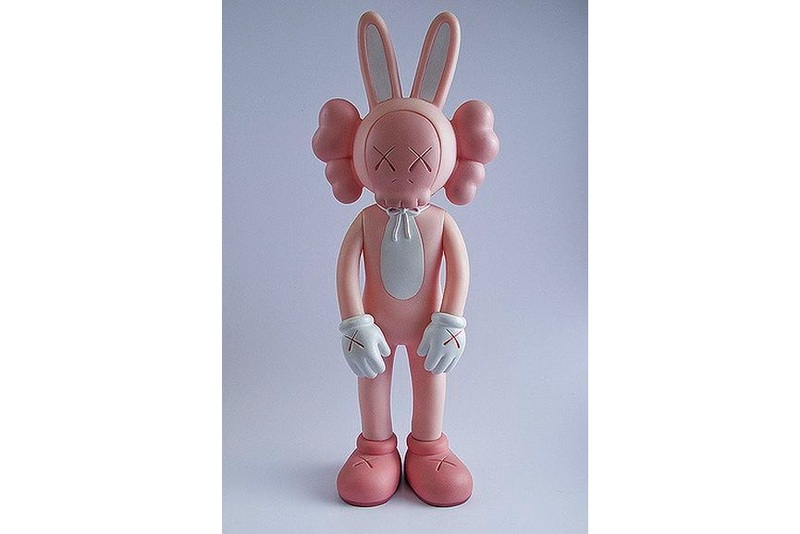 Brian Donnelly aka KAWS is currently one of the leading figures when pop art is concerned. 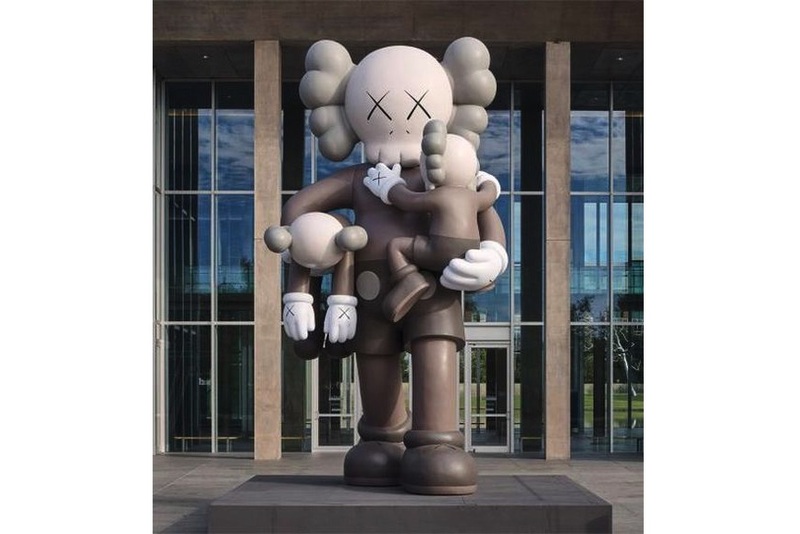 Starting as a graffiti artist, KAWS quickly climbed the ladder to the art galleries worldwide, becoming a significant figure in the contemporary art world. 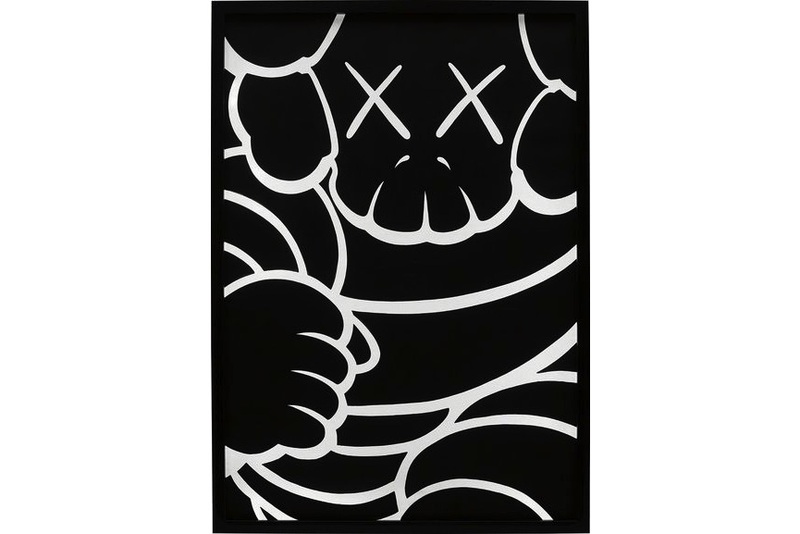 Drawing his inspiration from the popular culture iconography, KAWS has developed a unique style which blurs the lines between fine arts, illustration, and commercials. He is also one of the artists who has proved the art skeptics wrong when it comes to the value of vinyl toys, showing that their place is not to be underestimated in the luxury art market. And while we’re talking about the art market you must be interested to see how successful are KAWS’ pieces at the auctions. 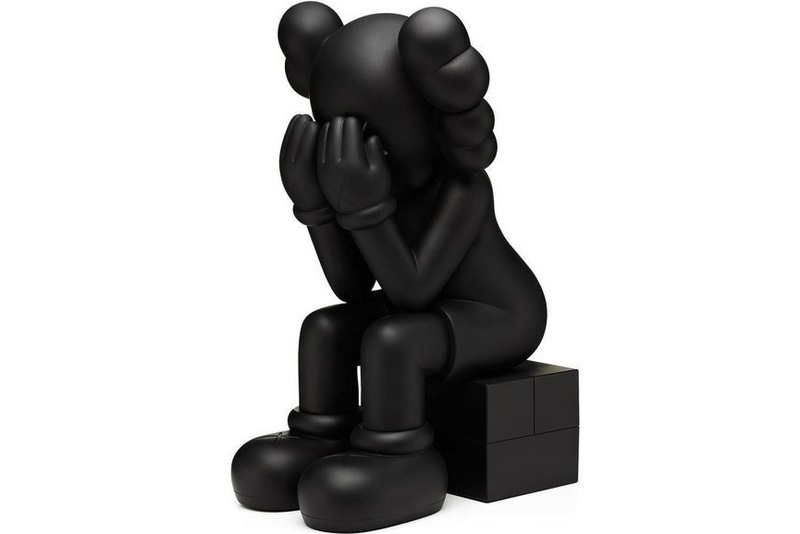 Therefore, we bring you the list of most expensive KAWS’ pieces, finishing our list with the no.1. Can you guess what it is? KAWS: Where the End Starts explores the artist’s prolific career in depth, featuring key paintings, sculptures, drawings, toys, and fashion and advertising designs. 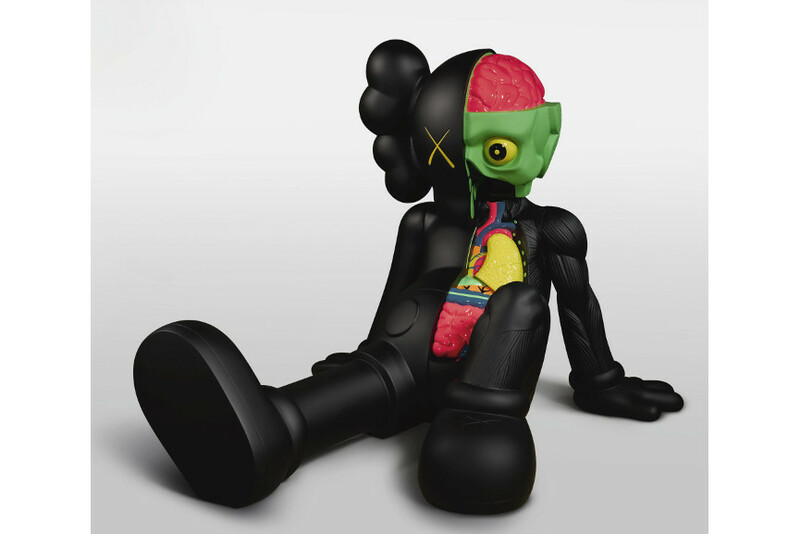 This extensive monograph, including contributions from Andrea Karnes, Michael Auping, Dieter Buchhart and Pharrell Williams, reveals critical aspects of KAWS’ formal and conceptual development over the past 20 years, as his career has shifted from graffiti to fine art and collaborations with designers and brands such as Comme des Garçons, SUPREME, Nigo (A Bathing Ape) and Nike. 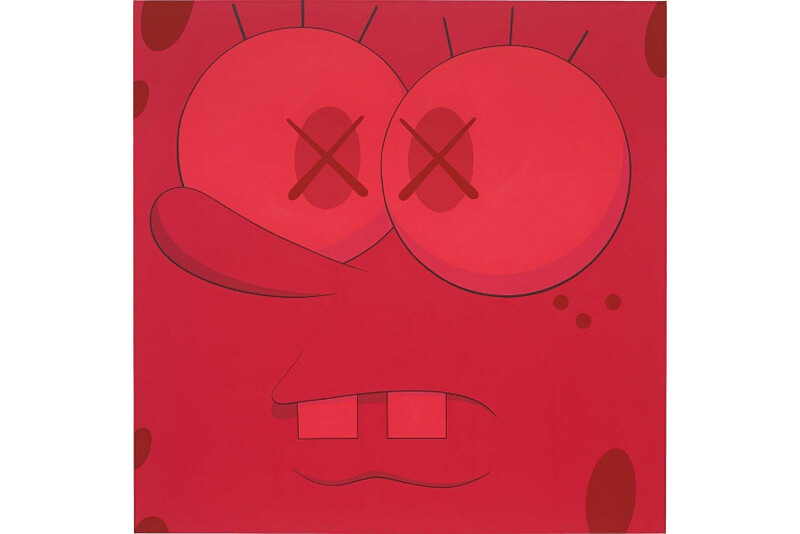 Featured image: KAWS – The Kaws Album, 2005. The piece was sold on September 8th, 2018 at Sotheby’s Hong Kong during their Contemporary Art Evening Sale for $522,311. More data on Untitled Mbfj8 here! The figure Companion (Passing Through) was modeled after the artist’s first outdoor sculpture presented in 2010 in the Ocean Terminal Forecourt in Hong Kong. It features the artist’s recognizable COMPANION character, sitting with his hands on his knees, covering his eyes in embarrassment. The work served as a self-portrait of the artist, as he tried to grapple with worldwide fame. This figure measures the same size as a real-life child, heightening the character’s poignantly human disposition. The piece was sold on April 1st, 2019 at Sotheby’s Hong Kong during their Contemporary Art sale for $547,774. More data on Companion (Passing Through) here! Reimagining one of the most absorbing personalities in contemporary culture, KAWS created Untitled featuring KAWSBOB. 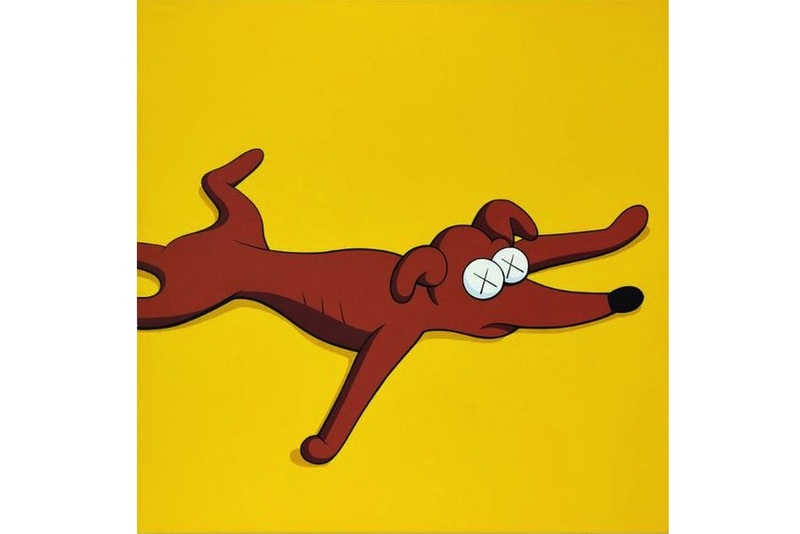 Executed in matter red tones, the character is stripped of his typically cheery yellow hue, reflecting the artist’s signature crossed-out eyes and abstraction. 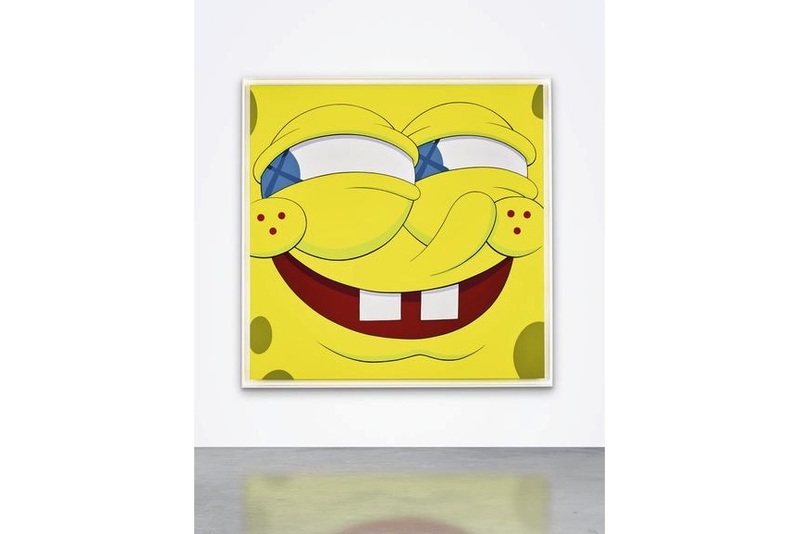 Although the character is recognizable through its eyes, nose and teeth, the portrait is strangely cropped, removing Spongebob from his usual underwater environment. Offered by Phillips Hong Kong during their 20th Century & Contemporary Art & Design Evening Sale, this work had the highest estimated price of $382,341 but reached the hammer price of stunning $548,022. More data on Untitled here! The present work features his recognizable character Chum, based on the Michelin Man. 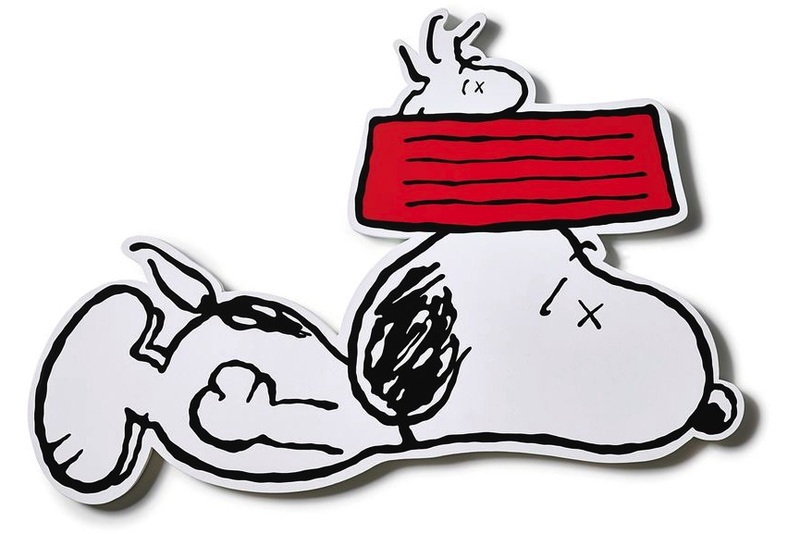 Appropriating the most recognizable trademarks of advertising, this character rendered with the artist’s recognizable crossed eyes incorporates childlike humor. “I wanted to work within the language of the ad, to form a dialogue,” the artist explained. Zoomed in and cropped out, the character is rendered in his characteristically clean-cut graphic use of line and glossy finish. Offered by Phillips London during their 20th Century & Contemporary Art Day Sale, the piece had the highest estimated price of $465,095 but reached the hammer price of $584,691. More data on Running Chum – Bus Stop here! Final Days is a truly global character from KAWS’ distinctive oeuvre. It features an idolized alteration of a hatless Kurf, rendered with a trademark crossed-out eyes, bones imitating hair and ears, distorted mouth and impeccable fabrication. For the first time in his practice, the artist used the extremely durable afrormosia wood from Africa, embodying certain spiritual energy within a work. Offered by Phillips Hong Kong during their 20th Century & Contemporary Art & Design Evening Sale on May 27th, 2018, the work reached a hammer price of $586,256. More data on Final Days here! 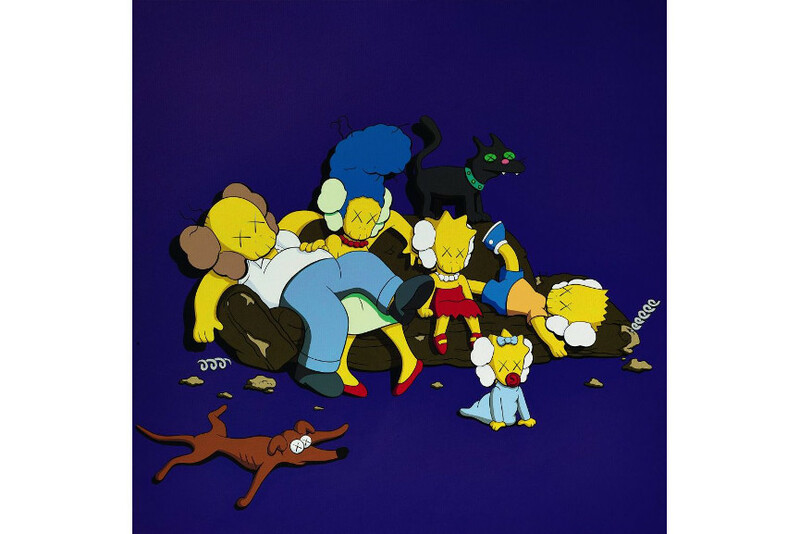 The work is part of the artist’s famed Kimpsons Series created in 2003, where KAWS reworked the beloved characters from The Simpsons series in his distinct visual style. Each character from the series features the artist’s signature X’ed eyes. It was sold on April 1st, 2019 at Sotheby’s Hong Kong during their NIGOLDENEYE® Vol. 1 sale for $611,479. More data on Kimpsons Series here! The work Companion (Resting Place) features KAWS’s iconic character half dissected and rendered in a sophisticated grey-scale palette. 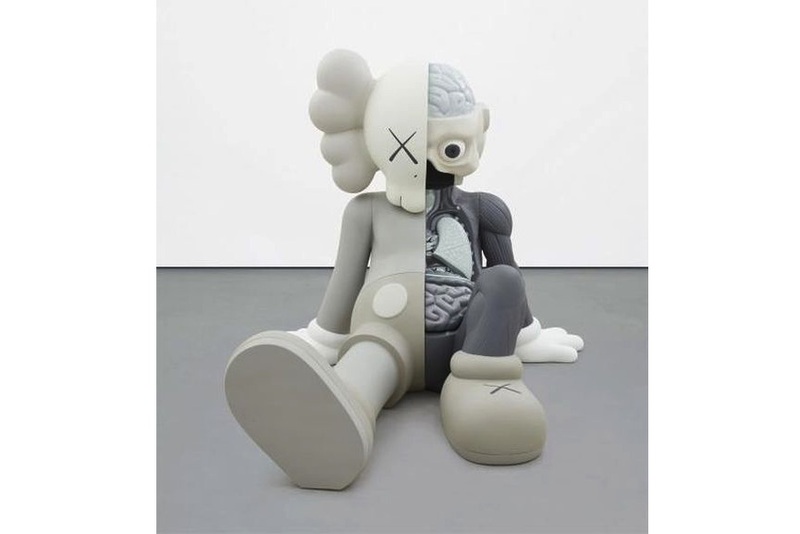 As intrigued followers requested more information about the characters, KAWS humorously revealed the literal interior of Companion, instead of providing further details on its psychological or emotional state. This work is one of the only few life-size grey sculptures completed during the final season of the artist’s brand OriginalFake. The piece was sold on November 25th, 2018 at Phillips Hong Kong during their 20th Century & Contemporary Art Evening Sale for $637,750. More data on Companion (Resting Place) here! This is another of only three life-size sculptures of Companion (Resting Place), a rare and particularly evocative rendition of KAWS’s ubiquitous COMPANION character. With its black body bisected, it reveals a colorful cartoon rendering of its anatomy. The sculpture evokes empathy, humor, as well as a meditative reflection on fragility and pathos of the human condition. The piece was sold on September 30th, 2018 at Sotheby’s Hong Kong during their Contemporary Art Evening Sale for $700,662, soaring past its highest estimate by 83%. 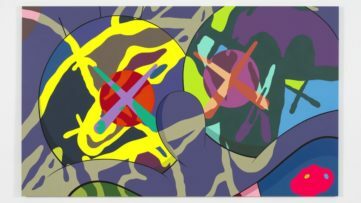 Painted in 2015, Untitled features sizeable fluorescent forms that when viewed from a distance, converge to resemble a close-up detail of one of KAWS’s signature creatures with cartoon hands covering its X-ed out eyes. Masterfully executed, the piece illustrates the pristine lack of visible brushstrokes. The piece was sold on November 25th, 2018 at Phillips Hong Kong during their 20th Century & Contemporary Art Evening Sale for $701,525, just over its high estimate of $637,750. 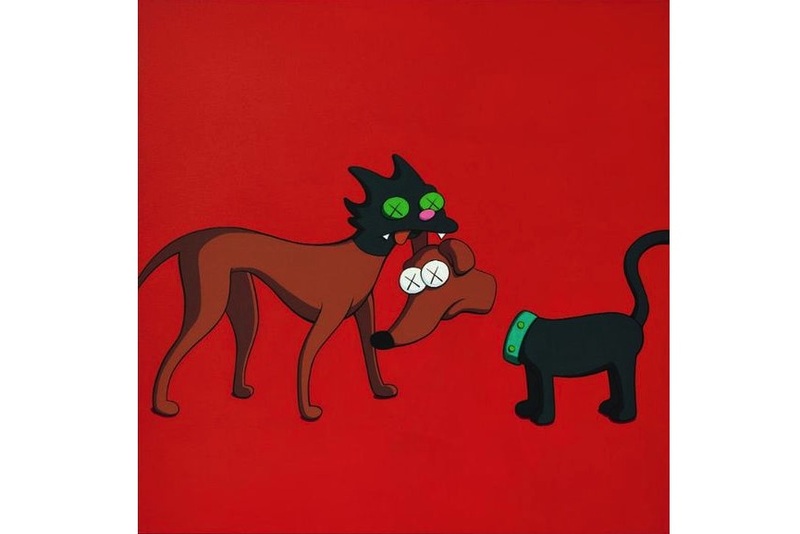 Here is another piece from the famed Kipsons Series, featuring the Simpson family’s cat and dog. Both characters have the artist’s signature X’ed eyes, while Snowball is biting off the head of Santa’s Little Helper. The piece was sold on April 1st, 2019 at Sotheby’s Hong Kong during their NIGOLDENEYE® Vol. 1 sale for $764,349. More data on Kimpson Series here! This is another version of the artist’s Accomplice but created at a towering height. Referencing a pink Bugs Bunny, the sculpture is an adult-sized toy, injecting humor into more mature notions of life and death. Drawing upon a connection to the art historical tradition of figurative sculpture, the work fuses childhood whimsy with a melancholic twist. Offered by Phillips London during their 20th Century & Contemporary Art Day Sale on March 9th, 2018, the work had the highest estimated price of $708,837 but reached the hammer price of $779,721. More data on Accomplice here! 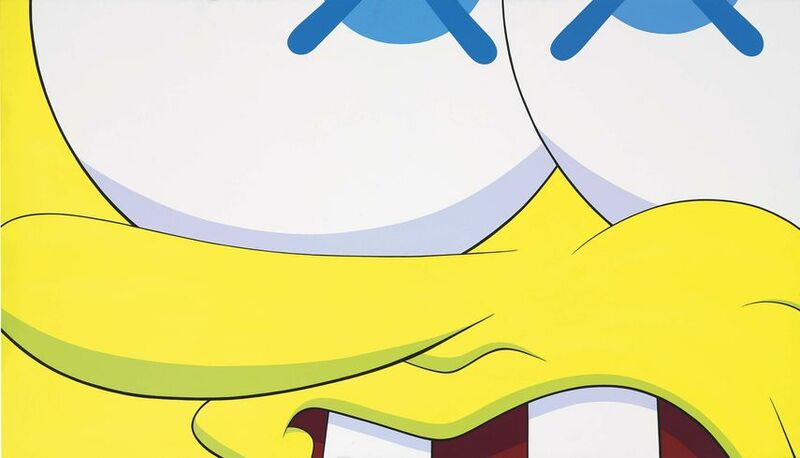 The piece Moving the Mirror from 2010 feature an ingenious riff upon the world-famous cartoon character SpongeBob, distinctively redesigned through the artist’s signature X-ed out eyes, obstructing the character’s vision but magnifying his daunting aura. The cropped, close‐up perspective of SpongeBob’s features serve to re-contextualize the character’s instantly-recognizable buck teeth and a yellow hue. Both visually familiar and symbolically arresting, the piece combines the seriousness of adult concerns with childish associations. 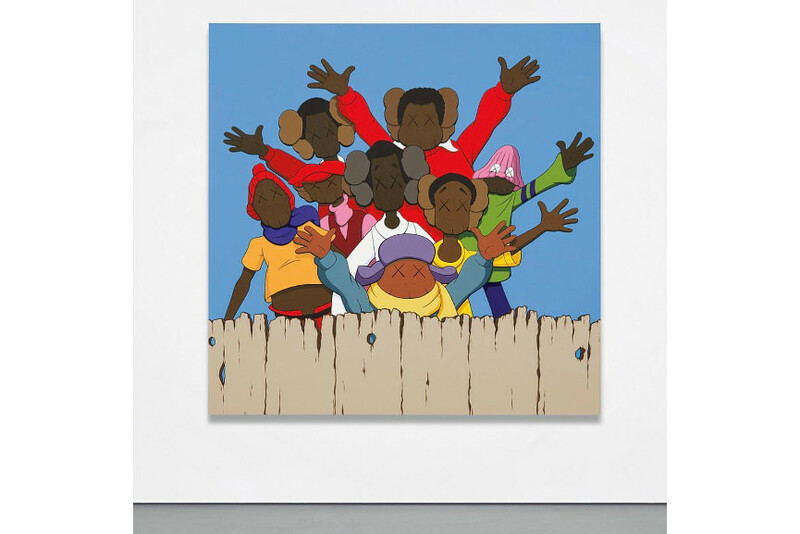 The piece was sold on March 7th, 2019 at Phillips London during their 20th Century and Contemporary Art Evening Sale for $858,798. More data on Moving The Mirror here! 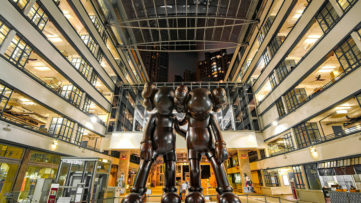 The Mickey Mouse character has featured prominently in the work of KAWS. Although we only see his arms in Keep Moving, he is rendered to be instantly recognizable. Showing his arms cut off with blood dripping from the violent incision, this lovely childhood character is placed in an unexpected gore context. 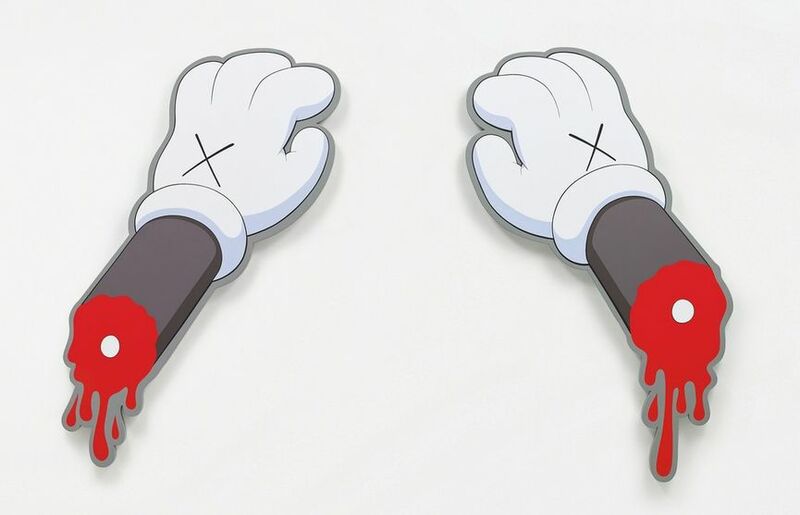 Mickey’s white gloves feature artist’s trademark crosses. Offered by Phillips London during their 20th Century & Contemporary Art Day Sale, the work had the highest estimated price of $354,418, but reached the hammer price of the unbelievable $1,063,256! More data on Keep Moving here! Again, we see the enlarged and widely recognizable face of one of America’s best-loved cartoon characters, SpongeBob. 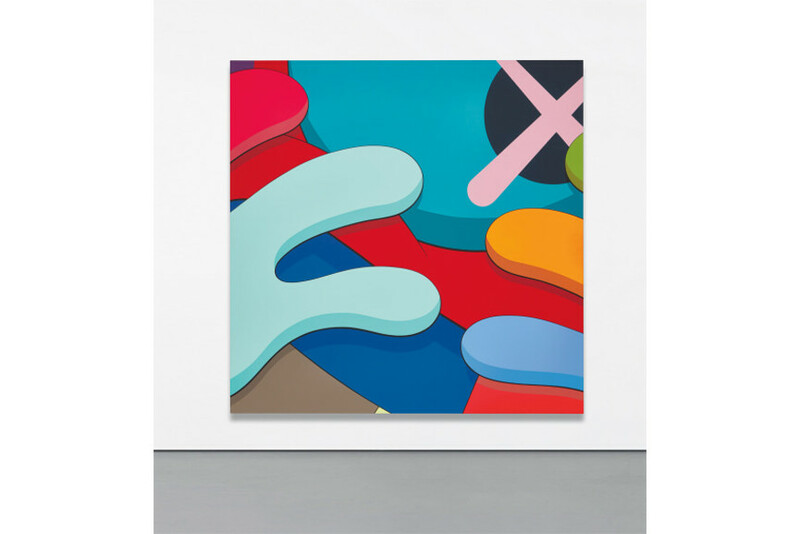 Magnifying, distorting and re-envisaging the character in this work titled Again and Again, KAWS offers a poignant social commentary on an image-saturated and media-obsessed contemporary society. As usual, the character’s eyes are crossed with pronounced Xs, suggesting the brain-numbing dangers of too much television. The piece was sold on October 5th, 2018 at Sotheby’s London during their Contemporary Art Evening Auction for $1,122,032. More data on Again and Again here! 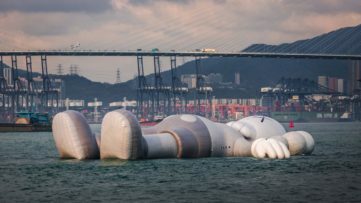 First unveiled in Hong Kong in 2014 as one of KAWS’ largest public sculptures, Clean Slate refers to wiping out the past and starting over again, stepping into the next stage of life. It features the popular COMPANION character on his feet, carrying two smaller COMPANIONS in his arms, embodying the new chapter in life. After being exhibited at Phillips Plaza in New York, it was sold by the auction house on November 15th, 2018 during their 20th Century & Contemporary Art Evening Sale for $1,650,000, much more than its high estimate, becoming the third most expensive piece sold by the artist. More data on Clean Slate here! A boldly-colored canvas that immediately attracts attention, Chum (KCB7) features a Michelin Man-inspired character striding toward the viewer out of the wall. Featuring uniform planes of red, yellow, orange, blue, and purple, the character seems full of potential energy and movement. 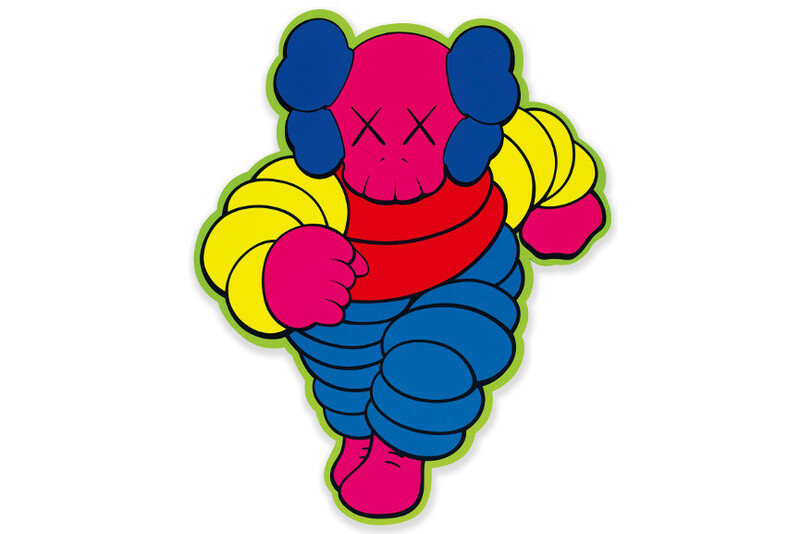 As other KAWS’s characters, it features the instantly recognizable X-ed out eyes. The piece was sold on November 15th, 2018 at Christie’s New York during their Post-War and Contemporary Art Evening Sale for $2,000,000, soaring past its estimate of $300,000 – $500,000. More data on Chum (Kcb7) here! Here is another work from the artist’s Kimpsons Series. Here we see an entire cast of the Simpson family on their living room couch. Set against a dark blue background, each character features their signature sprouting puffy crossbones and X’ed eyes. Almost sliding off the couch, the characters appear either drunk or dead. The piece was sold on April 1st, 2019 at Sotheby’s Hong Kong during their NIGOLDENEYE® Vol. 1 sale for a staggering $2,165,654, soaring past its estimate of $509,566 – $764,349. More data on Untitled (Kimpsons #3) here! Another riff of The Simpsons, Untitled (Kimpsons) features the entire Simpsons family on the couch, but this time, seating neatly and getting ready to watch the TV. The piece was sold on April 1st, 2019 at Sotheby’s Hong Kong during their NIGOLDENEYE® Vol. 1 sale for an amazing $2,229,350, soaring past its estimate of $509,566 – $764,349. More data on Untitled (Kimpsons) here! Painted in 2004, Untitled (Fatal Group) evinces KAWS at his most technically accomplished and conceptually resolute. Carefully balancing block colors and monotone shadows, the artist refigured the cast of the animated series The Fat Albert Show with their heads composed in the artist’s trademark cross-eyed skulls. At the same time, the piece alludes to the historical genre of the group portrait that was popularized in 16th and 17th century Europe. The piece was sold on November 15th, 2018 at Phillips New York during their 20th Century & Contemporary Art Evening Sale for an amazing $2,251,250, soaring past its estimate of $700,000 – $900,000 and breaking the artist’s record. More data on Untitled (Fatal Group) here! 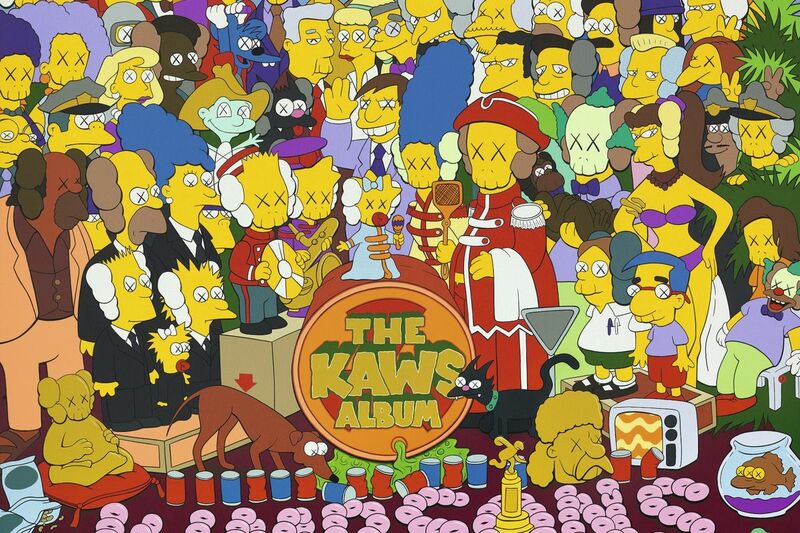 Created in 2005, The Kaws Album is an appropriation of appropriation, KAWS’s take on The Simpsons’s The Yellow Album, which is a riff on the cover art for the Beatles album Sgt. Pepper’s Lonely Hearts Club. 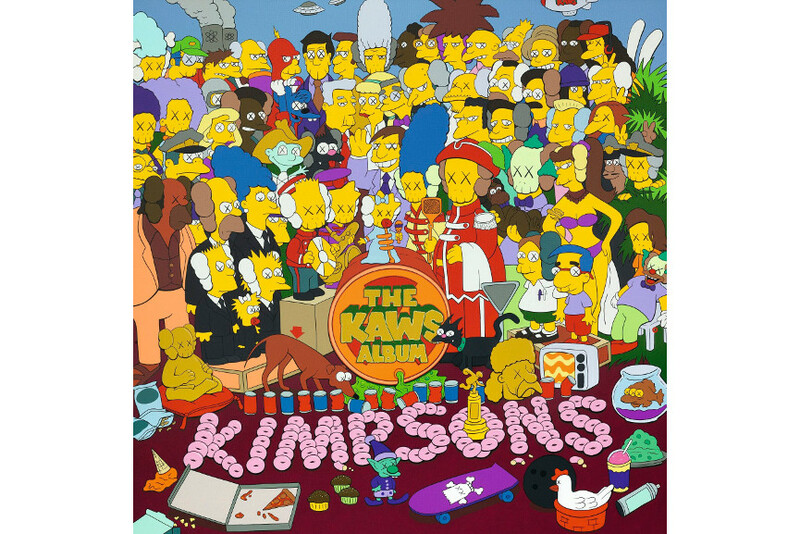 It features a whole cast of the artist’s Kimpsons characters with their signature sprouting puffy crossbones and X’ed eyes. 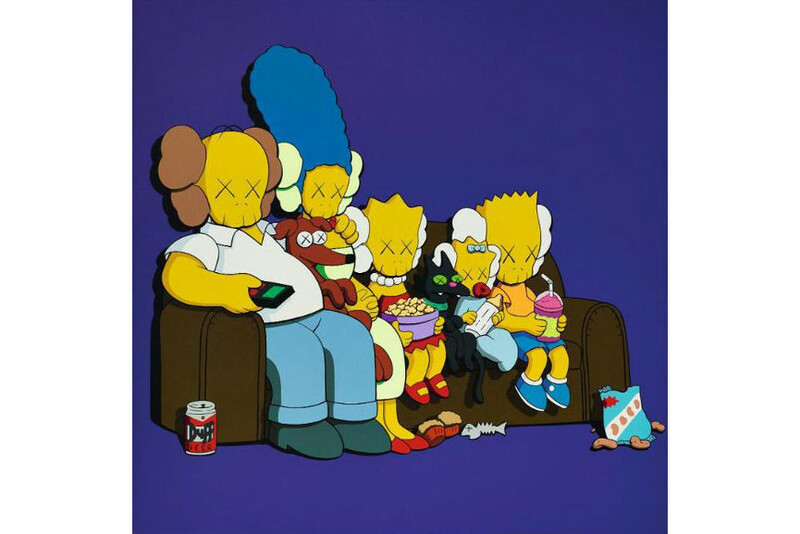 Kimspons are accompanied by KAWS’s popular COMPANION, seated on the left of the composition. One of the most accomplished works on canvas the artist ever created, it epitomizes his entire artistic and cultural lexicon. The piece was sold on April 1st at Sotheby’s Hong Kong during their NIGOLDENEYE® Vol. 1 sale for a staggering $14.7 million, setting a new auction record for the artist. The piece soared past its estimate of $760,000–$1 million to a spectacular finish. 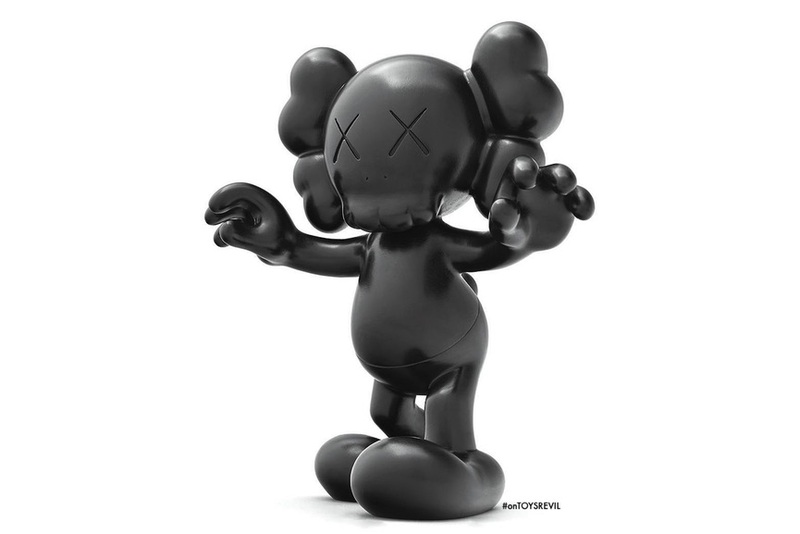 More data on The Kaws Album here!